Clio Barnard's DARK RIVER is arguably one of the finest film's of the festival. It's a dark, sparse, claustrophobic chamber drama - beautifully acted and edited, with not an ounce of fat on its bones. It's so emotionally intense that the 90 minute runtime feels like three hours in the best possible way. By this I mean that it didn't feel overlong at all, but I really felt emotionally rung out by the end of it. I suspect that it's a film that's going to be with me for days to come - its scenes haunting me. The film rests on the twin performances of Ruth Wilson (THE AFFAIR) and Mark Stanley (DICKENSIAN). 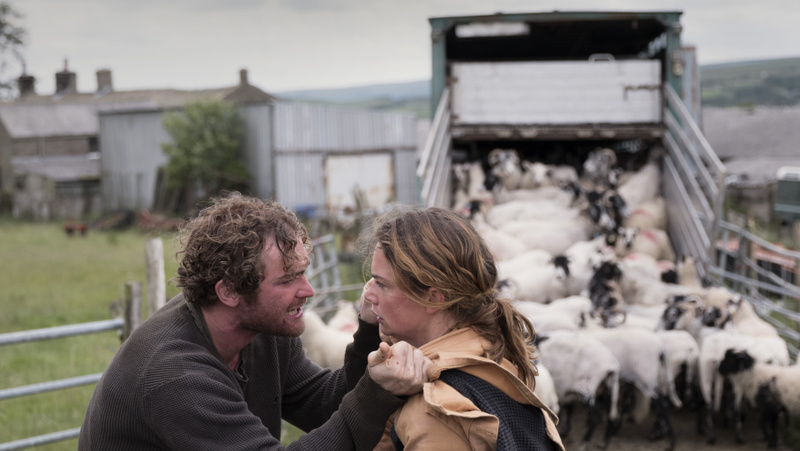 Wilson plays a capable sheep farmer called Alice who returns home after a 15 year absence when her father, who had abused her as a child, finally dies. She's still massively traumatised by that abuse, and Clio Barnard depicts it as a kind of visceral haunting. Alice believes her father would've left her the tenancy of the family farm, but the person sitting in possession is her angry brother Joe (Stanley). He resents Alice for leaving, and her need to update farming methods. In fact, he'd rather sell the farm to property developers than co-farm with Alice. Over the 90 minute the tension between the two until we have the expected final confrontation and revelation that leads to some kind of emotional pay-off. There's a real vulnerability and violence to the lead performances and Stanley matches the more famous Wilson pound for pound in the confrontation. I won't say more for fear of spoiling the outcome. However, I was surprised to find that Meester Phil had an utterly different interpretation of the final scene to mind, which suggests that this film is even more slippery than I'd thought. DARK RIVER has a running time of 89 minutes. The movie played Toronto and London 2017. It opens in the UK and Ireland on February 23rd and in the Netherlands on August 2nd. It is rated 15 in the UK for strong language.